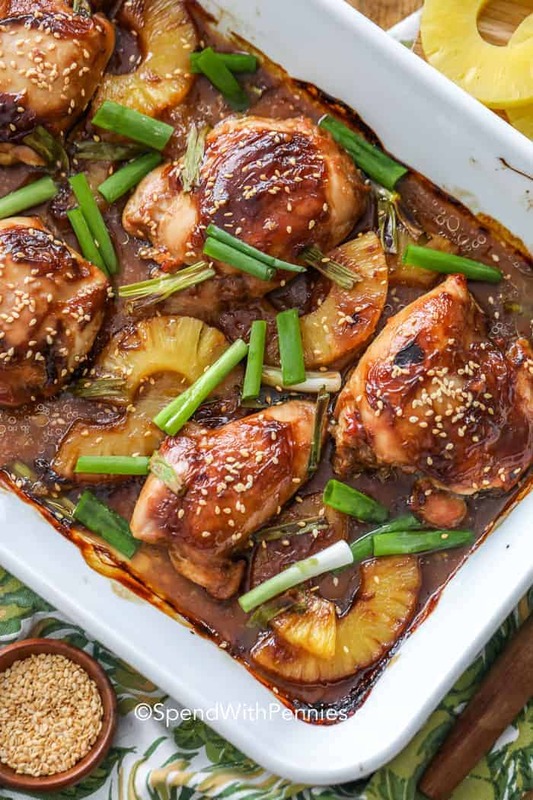 This easy Pineapple Teriyaki Chicken is a delicious weeknight meal. Chicken is marinated in a homemade teriyaki sauce full of pineapple flavor (store bought sauce will work fine if you’re in a rush). 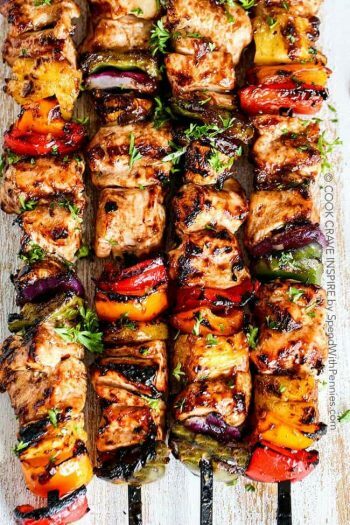 Grill or bake them to perfection and serve them over white rice for an easy and delicious dinner option! We love making teriyaki chicken pineapple bowls with our favorite fried rice! Did you know that teriyaki is actually a technique of cooking? It’s a Japanese method of grilling or broiling with a combination of sugar and soy sauce (and often mirin). This recipe is great baked in the oven (and then broiled) and perfect in the summer when you’re craving Grilled Chicken! 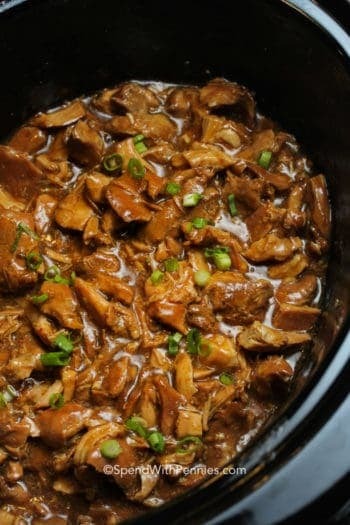 I love teriyaki, it has great flavor and is perfect for Teriyaki Chicken stir fry, great for teriyaki pork and of course wonderful for chicken! This recipe has fairly basic ingredients, most of which you’ have on hand! Chicken: I love to juiciness of chicken thighs in this recipe. You can use chicken breasts if you’d prefer, adjust the cook time so the chicken reaches 165°F. 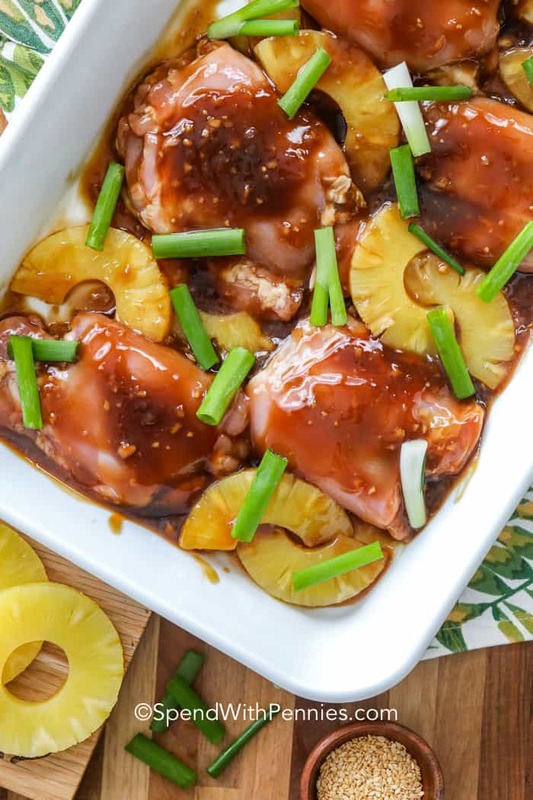 Pineapple: Adding a bit of pineapple juice to the teriyaki sauce adds great flavor! You can swap out the pineapple for orange juice in the sauce. The sweetness of teriyaki lends itself well to various fruits (like fresh mango). I use canned pineapple rings in this recipe since it’s easy but you can use tidbits (if you’re making this recipe in the oven) or fresh or frozen pineapple. 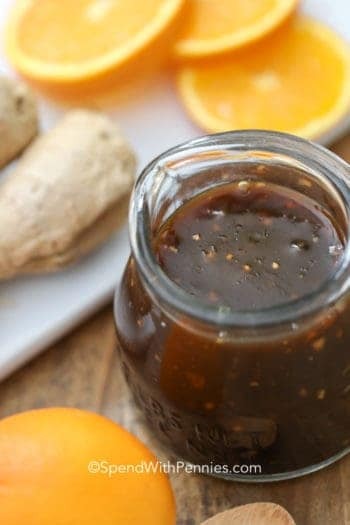 Teriyaki Sauce: This recipe uses homemade sauce but any store bought sauce will work too. You’ll want a thicker sauce (more the consistency of barbecue sauce). If your store bought sauce is thin, you can add a splash of pineapple juice and thicken it with a bit of cornstarch as directed below. 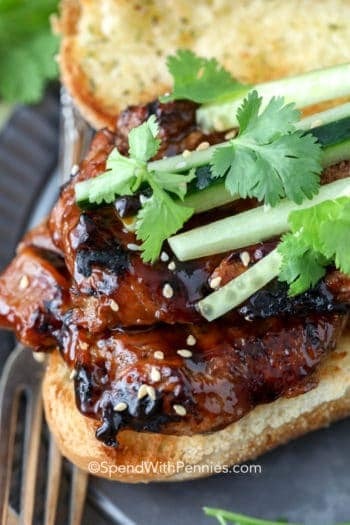 This is a slight variation from a traditional teriyaki sauce, but it has SO much flavor. I like to baste (or brush) the sauce onto the chicken as soon as I put them on the grill or bake them to ensure that it has a chance to caramelize to the chicken! MIX: Mix the teriyaki sauce ingredients together. Reserve half of the sauce to thicken for basting. MARINADE: Marinate the chicken breasts for about 4 hours or overnight in the teriyaki sauce. I like to do this in a freezer bag. If you’re short on time, try to marinate for at least 30 minutes if possible, the longer you do, the better the flavor! GRILL OR BAKE: Grill chicken for about 7 minutes on each side or until they reach an internal temperature of 165°F with a meat thermometer. Alternatively (in the winter), bake in the oven. 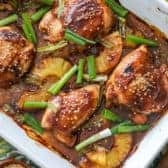 Pineapple teriyaki chicken is sweet but has a lot of flavor and is best paired with sides that are light and fresh. 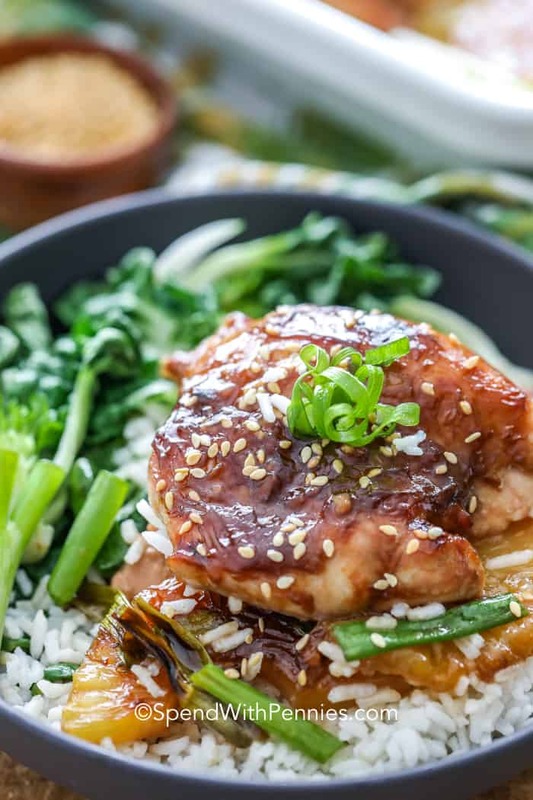 I like to serve pineapple teriyaki chicken with rice, but it’s also great with Sesame Ginger Snap Peas, bok choy, or Steamed Broccoli. 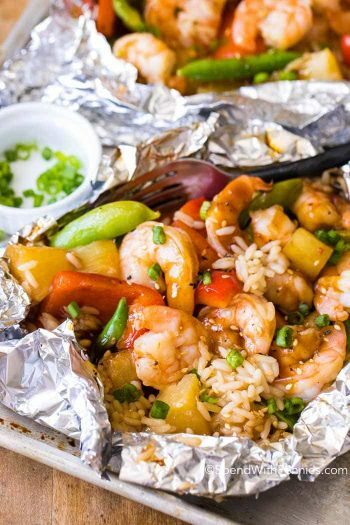 Shrimp Stir Fry – Quick and full of fresh veggies! Easy Mongolian Beef – Reader favorite! Beef and Broccoli – Classic combo! Chicken Lo Mein – Better than store bought! Chicken and Broccoli Stir Fry – Super fast! 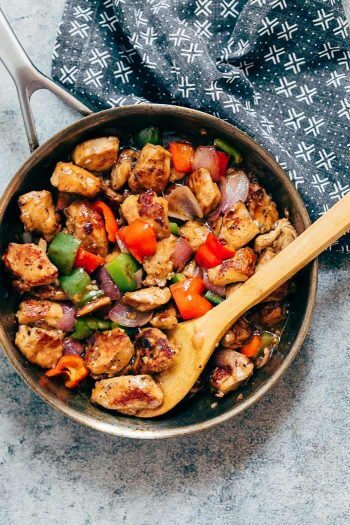 Cashew Chicken Stir Fry – Easy take out at home! 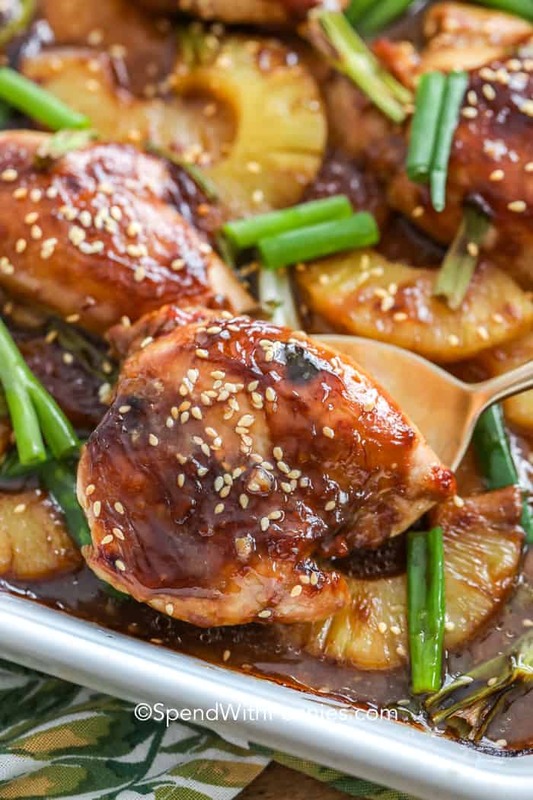 This easy pineapple teriyaki chicken is the perfect dinner recipe! Combine all sauce ingredients. Set half of the sauce aside and refrigerate. Combine chicken with remaining sauce. Marinate 4 hours or overnight if possible. Thicken Remaining Teriyaki Sauce: Place reserved sauce in a small saucepan and bring to a simmer. Combine cornstarch with 2 tablespoons water. Add cornstarch a little at a time to reach desired consistency, you may not use all of it. Remove chicken from marinade and discard marinade. Place chicken, pineapple rings and green onions in a 9x13 pan. Top with thickened teriyaki sauce. Bake at 425˚F oven for 25 minutes or until chicken reaches 165°F. Broil 3-5 minutes or until brown. Grill chicken basting with thickened sauce for about 6-8 minutes per side or until no pink remains. Grill pineapple slices for 5 minutes.